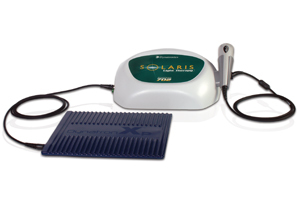 The Solaris light therapy probes have been cleared by the FDA to provide topical heating for temporary increase in blood circulation, temporary relief of minor muscle and joint aches, pain and stiffness and relaxation of muscles, for muscle spasms and minor pain and stiffness associated with arthritis. What can be treated by light therapy? Inflammatory conditions (bursitis, general tissue inflammation, nerve inflammation including median nerve facial nerve and bells palsy etc. Pain control (acute and chronic) Carpal tunnel syndrome, Head and neck pain, low back pain, Arthritis, post herpetic neuralgia etc. When the light (photons) is applied to the tissue, they get absorbed into the mitochondria (energy cells) and cell membranes by chromatophores (color pigments in cell). This results in elevation of cell ATP synthesis (increased energy availability). This leads to increased DNA and RNA synthesis which are essential for tissue repair and pain control. The cell uses this extra energy to attain homeostasis (balance). Light therapy is backed by extensive research with more than over 2000 published studies some to demonstrate the physiological action of light therapy and others to prove its clinical efficiency. Currently studies are being performed by scientists at NASA to demonstrate effectiveness of light therapy in tissue healing. Light and LASER therapy are relatively safe to use. The type used in physical therapy for tissue healing has been classified as Class II Laser with only safety precaution being avoiding staring directly into the beam. Other precautions/contraindications could include avoiding irradiation over the abdomen of pregnant women, and over cancerous tissue. With many medications being pulled off the market due to secondary health risks, light therapy and other physical modalities could be forerunners in the treatment of pain in the near future due to their relative ease of use and decreased secondary health risks. Light therapy is also an invaluable tool for athletes; both to maximize performance and to promote healing between training sessions.